Getting to Venasque is more than worth it. It is a hard climb to the village, but the landscapes you discover upon arriving are the greatest reward. In the spring, Venasque, one of the "Most Beautiful Villages in France", totally changes colour. The cherry trees bloom with white flowers, harbinger of the good things to come. The hotel garden is also very pleasant in any season and the swimming-pool very popular in summer. 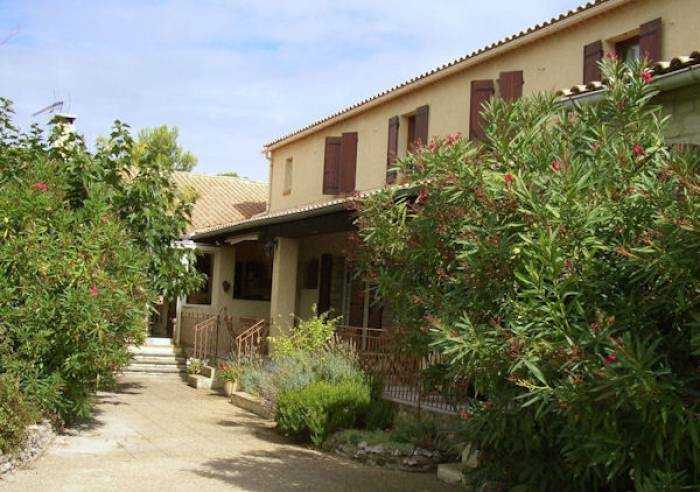 Hotel de la Garrigue is ideally located at the outset of many hiking possibilities. The most ambitious guests may decide to take on Mont Ventoux, others may prefer to wander the streets of Gordes or Avignon. Take the time to browse the antique dealers in Isle sur la Sorgue. After a day's outing, enjoy the peace and quiet of the garden, the refreshing waters of the pool. Our rooms exude Provencal charm and character, certain rooms on the ground floor open onto the garden, upstairs rooms are air-conditioned. In the summertime, meals are served out of doors, under the lovely shade of magnificent mulberry trees. Bank/credit card, Cheque, Chèques Vacances. Wi-fi, Free private internet access, Air conditioning, Television, Swimming pool, Restaurant, Garden, Car park, Pets welcome, Pets supplement, Restaurant, Picnic hampers.